Automobile accidents cause damage to vehicles, property and, most importantly, injury or even death to drivers, passengers or pedestrians. The bills build up quickly, and the recovery process can be long and painful – in fact, you may never recover completely from automobile accident injuries. As long as you were not responsible for causing the accident, you may be entitled to compensation for your medical bills, lost wages or other income, pain and suffering and even diminished quality of life. This compensation may come from the insurance of other drivers, commercial establishments, governments responsible for infrastructure maintenance and design, or even your own underinsured motorist insurance coverage. Douglas Standriff has the expertise and experience in the Northern New Jersey courts to make sure you get every dime you deserve, and that your rights are protected. Douglas Standriff uses a variety of tools to try to arrange an out-of-court settlement between the various insurance companies involved in an automobile accident. Should your case go to trial, however, you can count on Douglas Standriff to present the facts in a manner that will leave the jury absolutely certain that you deserve the compensation you’re requesting. Douglas Standriff is a veteran in the New Jersey courts, and he knows how to educate and convince a jury so that you get the greatest possible compensation for your injuries and other expenses relating to this automobile accident. Take, for example, these photos. 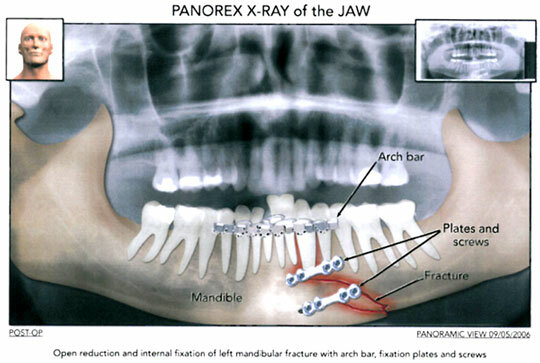 The first (below) depicts Chris S.’s broken jaw. Chris had an unusual type of automobile accident. A tool fell off of a truck in front of him, bounced through the windshield and struck Chris in the jaw, fracturing it in several places. The truck had no insurance, but Douglas Standriff used these photos in court to prove the severity of Chris’ injury, and he was able to get obtain a large award from Chris’ own uninsured motorist coverage. The second photo (on left) shows Karla Z’s neck. She was rear-ended by a commercial vehicle. Her brand new Mustang was a total loss. After two years of physical therapy, injections and pain management efforts, Karla, just 27 at the time, was forced to undergo spinal surgery. 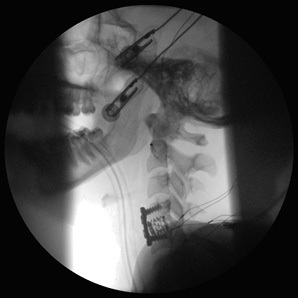 The damaged disc ("herniated disc" at C4-5) in her neck was removed and replaced with bone grafts, which were in turn held in place using a metal plate and screws, with the ultimate result of Karla’s neck bones fusing together. These dramatic photos showed beyond a doubt that Karla’s injury was severe and permanent, and she received a significant settlement. Immediately after an automobile accident, Northern New Jersey residents should contact Douglas Standriff for a no-obligation consultation. 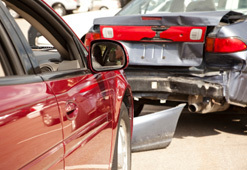 He will help you to determine whether you have a winnable personal injury case. He will be with you every step of the way, gathering all of the necessary information on your behalf and ultimately, expertly applying New Jersey law to get you the compensation you deserve.